SRINAGAR, India (AP) — Anti-India protests and clashes erupted in several places in disputed Kashmir on Thursday after Indian troops killed a young shepherd who was tending his sheep, officials and residents said, and an Indian soldier and three rebels were killed in two separate gunbattles. Residents in Indian-controlled Kashmir’s main city, Srinagar, said government forces shot the young man during a raid early Thursday. The man was caring for his sheep when troops fired at him, they said. Police have yet to make a statement. The killing triggered protests and clashes as hundreds of people poured into the streets in several places in downtown Srinagar calling for the end of Indian rule. They chanted slogans such as “Go India, go back” and “We want freedom” as some residents pelted police and paramilitary soldiers with stones. Government troops fired tear gas and shotgun pellets to quell the protests while authorities restricted movement in the old quarters of the city. Later thousands attended the man’s burial. Elsewhere, India’s army said a soldier and a rebel were killed in a gunbattle Thursday in southern Qazigund area. Col. Rajesh Kalia, an army spokesman, said troops raided a village in the area on a tip that some militants were hiding there, leading to an exchange of gunfire. Also on Thursday, two militants trapped in a mosque during a counterinsurgency operation in Panzan village were killed in an exchange of gunfire with troops, police said. 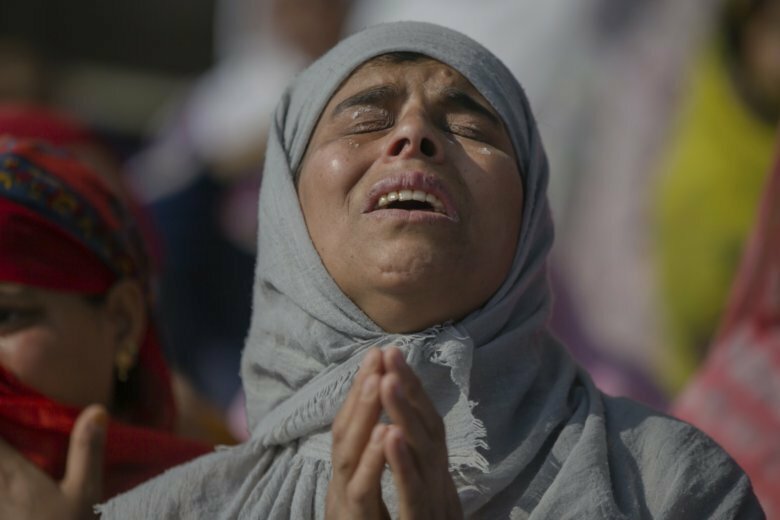 As the siege continued, villagers tried to march toward the mosque in solidarity with the rebels, leading to clashes between stone-throwing protesters and government forces who fired tear gas shells and pellets. Over a dozen people were injured in the clashes. Police said soldiers earlier shot and killed an Indian man working as a laborer with the Indian military’s road construction unit as he walked into an anti-rebel ambush near a military camp in northwestern Kupwara town. Most Kashmiris support the rebel cause of unifying the divided region either under Pakistani rule or as an independent country, while participating in civilian street protests against Indian control. In recent years, young Kashmiris have displayed open solidarity with rebels and sought to protect them by engaging troops in street clashes during military operations.